Run Molly Run is a Portland company that creates running jewelry. 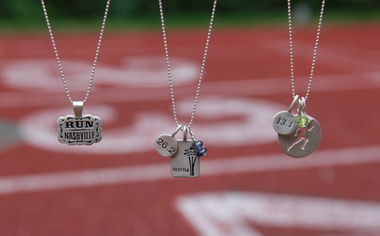 This is the coolest running jewerly I've seen out there. It's sterling silver, very well made and cool modern designs. I ran into Run Molly Run a few years ago at the Portland Marathon. They do special designs for specific marathons that are really cool. You can add and layer the pendants and create something really unique. Portland Marathon Aid Station - Volunteers needed!